Early in the 115th Congress, Rep. Elise Stefanik (R-NY-21) introduced this resolution with 22 Republican cosponsors, many of whom are members of the Climate Solutions Caucus, to help change the narrative on environmental issues. During National Clean Energy Week, the ACC stood with these 23 Representatives and promoted conservative environmental stewardship on campuses across America. We implore House Republican Leadership and the rest of the House Republican Caucus to cosponsor this resolution. H.R. 943 is authored by Rep. Carlos Curbelo (R-FL-26) and authorizes the Secretary of Commerce to award competitive grants to combat certain invasive species of lionfish in the Atlantic Ocean and Gulf of Mexico. Public-private partnerships are one of the greatest tools for environmental stewardship, and the competitive grant process this legislation mandates puts funding in the hands of the most innovative and competitive American companies. S.282 is legislation authored by Senator Dean Heller (R-NV) that expands the cultivation of geothermal, solar, and wind energy on public lands. As America transitions to its renewable energy future, it is important to invest in renewable energy on public lands, rather than on the extraction of more harmful forms of energy. This legislation is cosponsored by a bipartisan group of Senators including Senators Steve Daines (R-MT), Cory Gardner (R-CO), and James Risch (R-ID). Due to many state legislatures not currently being in session, this edition’s regional policy update will feature several states with notable legislative activity. States that aren’t listed are either out of session or are in session without any environmentally-related action occurring. On October 10, the Wisconsin State Senate Committee on Agriculture, Small Business and Tourism has a hearing pertaining to Senate Bill 224, which address veteran farm assistance and outreach programs. On October 11, the Wisconsin State Assembly Committee on Natural Resources and Sporting Heritage is having a public hearing on Assembly Bill 490 and Assembly Bill 491, both of which deal with hunting or fishing licenses. On October 11, the Michigan Legislature’s House Natural Resources Committee will hold a hearing on four pieces of legislation. On October 2, Rep. Tom Emmer (R-MN) introduced H.R. 3905: Minnesota’s Economic Rights in the Superior National Forest Act, which requires that Congress approve “any mineral withdrawal or monument designation involving the National Forest System lands in the State of Minnesota, to provide for the renewal of certain mineral leases in such lands, and for other purposes. On October 16, The Pennsylvania Joint Legislative Conservation Committee will hold its monthly forum. On October 2, the House passed H.R. 2316: The Cooperative Management of Mineral Rights Act of 2017, which preserves the development of oil and gas deposits on certain lands in Allegheny National Forest in Pennsylvania. On October 3, Rep. Ron Estes (R-KS) introduced H.R. 3914, which addresses limitations placed on Lake Afton Park in Sedgwick County, Kansas by mandating that the park can only be used for public outdoor recreation because it receives funding under the Land and Water Conservation Fund. On October 10, the General Court of Massachusetts’ Joint Committee on Environmental, Natural Resources and Agriculture will host a hearing on the NPDES Delegation and the Mohawk Trail Woodlands Partnership which largely addresses water quality and pollution. 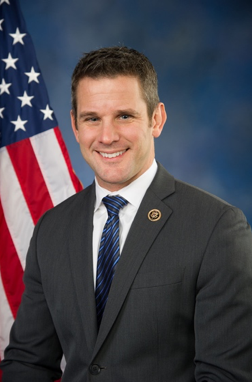 Congressman Adam Kinzinger (R-IL-16) is one of the Republican Party’s rising stars. At the age of 39, he is already serving his fourth term in Congress as a veteran of the War in Afghanistan and Operation Iraqi Freedom where he rose to the rank of Major in the United States Air Force. In the 114th Congress, he served as a co-Chair of the Tuesday Group, an influential caucus of moderate Republicans, along Representatives Charlie Dent (R-PA-17), and Bob Dold (R-IL-10). In the 115th Congress, Representative Kinzinger has already introduced multiple pieces of legislation that promote conservative energy solutions. H.R. 723, the Energy Savings Through Public-Private Partnerships Act of 2017, is a bipartisan bill that helps promote energy efficient upgrades at select federal facilities. The ACC is a proponent of free-market solutions and public-private partnerships to promote efficient energy usage, and this proposal features both of these techniques. H.R. 1320: Nuclear Utilization of Keynote Energy Act of 2017, is also bipartisan and helps promote nuclear energy – an essential form of renewable energy of which the ACC is a strong proponent. Get the Policy Newsletter directly to your inbox monthly.